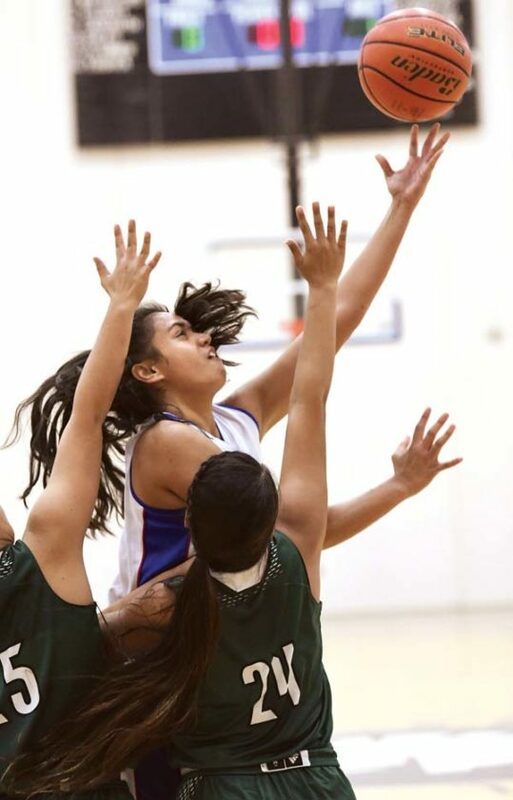 OLINDA — The Seabury Hall girls basketball team is used to playing with only a few players, but the Spartans pushed the idea to the limit on Friday night against Molokai at the Erdman Athletic Center. 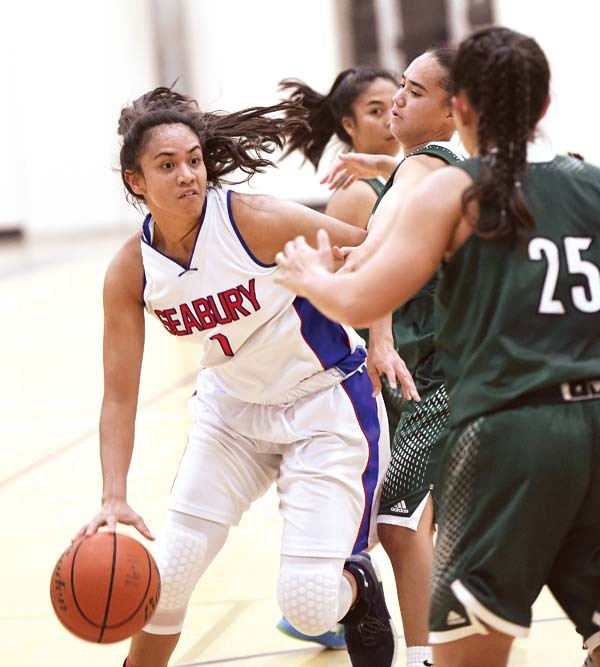 Anaulei Tuivai — the Maui Interscholastic League Division II Player of the Year last season as a freshman — had 17 points to lead Seabury Hall, while Ameera Waterford added 11 in a 45-30 win. With a roster of just seven players — the same number they used to win the MIL D-II title last season –the Spartans (3-0) were down to five on Friday, with Faylin Sales on a family vacation and Rachel Gilbert injured. Lacey Flammer took the floor and finished the game with six points despite being sick. The two teams play again this morning at 10 a.m.
A 3-pointer by Quincee Tanaka 25 seconds into the second half pushed the Spartans’ lead to 21-14, and the Farmers would not get closer than five the rest of the way. 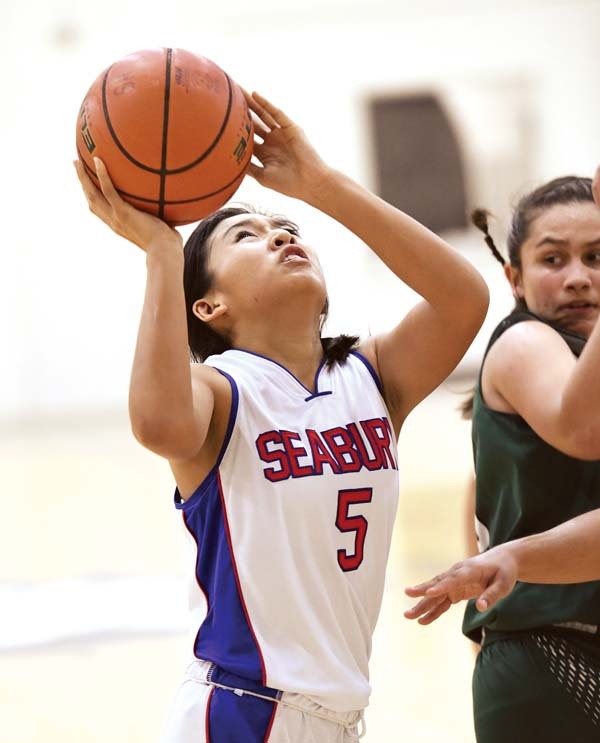 A 3 by Flammer gave the Spartans a 35-22 lead with 30 seconds left in the third quarter — Seabury Hall took control of the game with a 17-8 advantage in the quarter. Flammer finished the game with four fouls and Tuivai had three. The game got a bit chippy at times in the second half. Seabury Hall scored the first nine points of the game before Molokai scored the next six. The Spartans led 11-6 at the end of the first quarter after Waterford made a pair of free throws. The Farmers (0-1) then went on an 8-1 run, taking a 14-12 lead on a jumper by Sydney Rawlins with 3:22 left in the first half. Tuivai made a pair of free throws with 1:18 to go before halftime to cap a 6-0 run for the Spartans, giving them an 18-14 lead at the break. 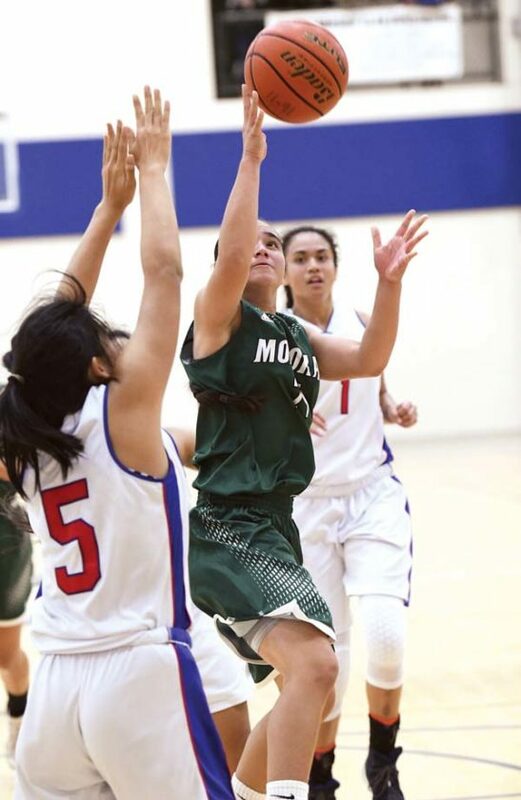 Molokai starting point guard Camille Ledesma committed her fourth foul with 5:13 left in the third quarter, but was able to finished the game without coming out. Mary Rose Ringor 2, Camille Ledesma 2, Sydney Rawlins 16, Tai-Li Tangatailoa 2, Kaitlin DeRouin 8, Paula Maroto 0, Alaijah Pastrana 0, Kawenaokala Davis 0. Anaulei Tuivai 17, Ameera Waterford 11, Chloe Gangnath 7, Quincee Tanaka 4, Lacey Flammer 6.